We would like to announce that ACHR support Our Indonesian Friends raising funds to build temporary housing for the victims of Indonesia’s Earthquake and Tsunami. Today, according to the Indonesian National Board for Disaster Management, the death toll from the quake and tsunami has risen to 1,558, on Friday, October 5th. Thousands were injured and tens of thousands - possibly hundreds of thousands - displaced from their homes and in need of emergency assistance. More than 70,000 homes were destroyed or damaged by the magnitude 7.5 quake that struck on September 28, launching waves of up to six-metres high that slammed into Sulawesi at 800 kilometres per hour. This fund will be utilized in recovery process on the ground and especially community-driven temporary shelters in Palu, Donggala and Sigi, Central Sulawei, Indonesia. The housing process will be carried out by Arkomjogja together with Kalijawi ( Women Savings Network). Arkomjogja is a NGO supporting community development in different cities in Indonesia. ACHR has experiences in recovery efforts and community-driven upgrading and housing over the past 30 years in Asia, and Indonesia is one of our strongest coalition members with an active national wide Community Architect Network. ACHR and CAN will help Indonesia Community Architect Network and Arkomjogja team for technical support and sharing experiences. 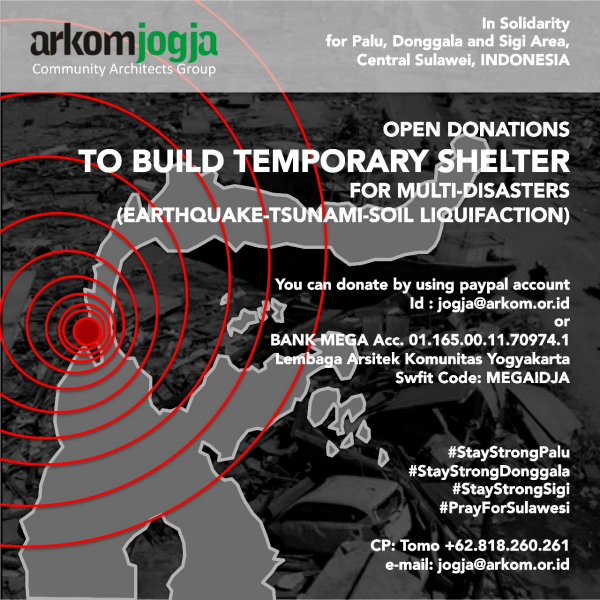 PLEASE send your donation/support directly to Arkomjogja ! KINDLY pass this message among your network, if possible. Minh Chau and ACHR team.